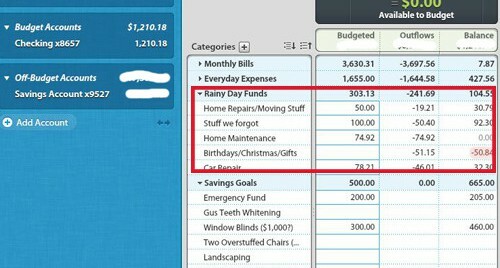 Let’s take another look at one such software tool – You Need a Budget (YNAB) and how it may be able to help you stop living paycheck to paycheck. If you haven’t read our first post about YNAB, you should read it now. Today, I am going to be drilling down into principles one and two. Lets go ahead and get started! The software is only software. It can’t make you change your spending behavior. You’ve got to do that. That’s why understanding the four principles is so key to being successful with YNAB. Let’s start with principle #1. By ‘giving every dollar a job’, you are now allowing yourself to spend money. It’s not only about NOT spending money but about knowing where your money is going to be spent. That can be very freeing in a way. You don’t have to feel bad about buying yourself some new shoes or new window curtains. As long as you have funded all the monthly bills and expenses you need to cover, any other money you have left over that particular budget category, then you can go ahead and spend the money. It’s that simple. 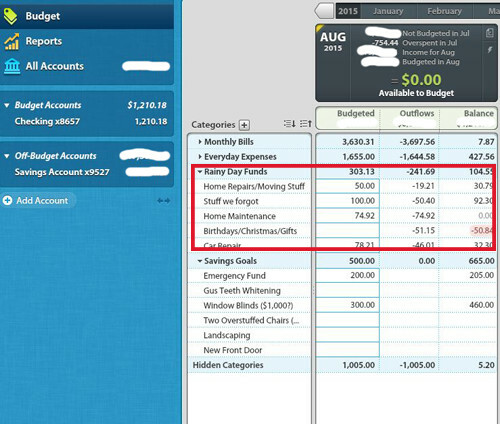 You get paid, you fund those monthly bills and recurring expense categories and make sure you have them all covered. Then if you have any extra money left over, you can fund some of those other ‘rainy day’ budget categories or ‘savings goals’ categories. You can see how these categories look in YNAB below. Maybe you can only put in a few dollars in each of these categories, but these amounts carry over into the following month so slowly but surely you can build up the money in each of these categories until you want to make the purchase. What can be quite strange about YNAB when you first start using it, is the fact that ‘categories’ are just placeholders in your mind for viewing your money in your checking account. For example, when you are creating those savings goal categories or rainy day categories we discussed above, you are just defining how you want to spend a portion of your checking account money. You are not actually moving money around in your various bank accounts. Stay tuned for the follow up article that continues to do a deep dive into YNAB principles three and four.